Hi this is Glora and today I have your new Designer Challenge. My challenge is to make a set of 4, 3"x3" cards. If you are up to an extra challenge make the cards with a critter theme, but all that is REQUIRED for my challenge is a set of 4, 3" x 3" cards. I hope you will join in the fun and thanks to Emma for letting me host a challenge on her blog. For these cards I used My Creative Time's Small Talk stamp set. It is perfect for 3x3 cards and it has an awesome variety of sentiments too. The faces are by Peachy Keen Stamps and the Teddy Bear cut is from Miss Kate's Cuttables. 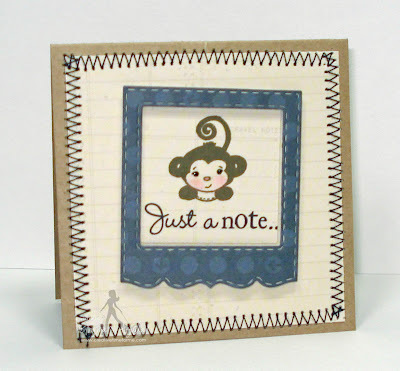 ~But all that is REQUIRED for Miss Glora's challenge is to make a set of 4, 3" x 3" cards. I sure hope to see LOTS of you participating in this super fun challenge! CONGRATS Miss Ema! Please email me at: info@my-creative-time.com your address so I can get your prize out to you ASAP! Geeze, I hate to sound like a dummy but how do I post on the challenge? Is there like a linky or anything? Cute cute cards you sure come up with so many great ideas so fast how do you do that?? Great tip for the 3 x 3 using the 12 x 12!! You sure are one talented and creative gal and can do with the snap of a finger I have creative envy right now. YOU ROCK!!! Oh my gosh these cards are soooo adorable. I have to say making 3x3 cards will be a challenge for me. In fact they will be my first ever 3x3 cards. lol. 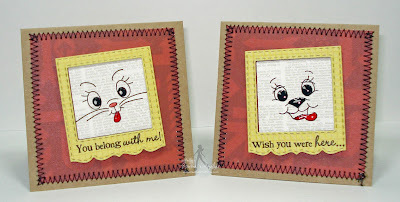 My Stitched Mini Frame will come in real handy for this challenge. Better put my thinking cap on. So darn cute...love all the mini cards!! OMG, I am LOVING all of these cards!!! Great designer challenge, Glora! I had an idea, and I ran out of time. I just might have to play along this weekend! Debican - Most of us that post have blogs, but I think you can post from Photo Bucket or another Photo site, maybe someone else can help out with an answer. OOPS Debican, I see you have a blog. Oh I know, there is no LINKY to add our projects. I'm sure they will put it up after. You'll see it. I feel like a dummy :) LOL There are no dummies here. Heheheeheheh. Fun Challenge!!! And congrats to Ema for the Rainbow Challenge. I love the idea of this challenge, now to sit down and complete it. Glora your bear faces are so cute. Emma I love the face in the frame. Such a cute idea. Adorable cards Glora and Emma! You both are so creative! Great job and fun challenge!! Great challenge, Glora. Can't wait to get going on mine. Love all the cards Emma, Glora, and DT. Oh my goodness Miss Glora what a fun challenge and not to mention your little 3x3's are ADORABLE with a capital A. Miss Emma, just CUTE as CUTE can be - I LOVE both your sets! and as ALWAYS the DT did an amazing job! I can't wait to get started! Very cute cards!! Everyone did an awesome job. Love this fun challenge. all the DT projects are so cute!! 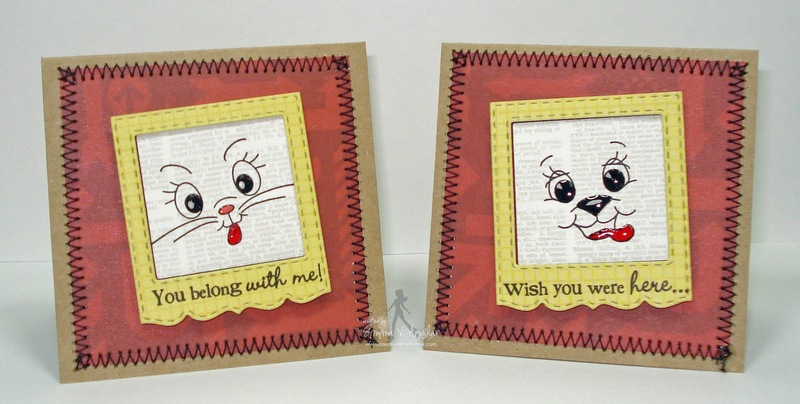 Love your kitty and doggy cards! OK...This is ADORABLE! !Love this FUN challenge with awesome inspirations!!! What a fun challenge Gloria! I am going to try to get in on this one. lol Everyone did an amazing job as always, Emma had the best and most talented DT!!! What a fun challenge Glora! Great job everyone!!! What a fun challenge! I think I may have to get in on this one! This was such a fun challenge. I had a blast playing along. Super fun challenge, as I love making 3x3 cards. Great inspiration from the design team. Thanks! Thanks for the fun challenge and enjoyed making this set. Thanks for the fun challenge, made a set for my daughter's teachers to thank them for all they do for our kiddos. Great challenge and great inspiration. another awesome challenge and fab DT projects!! So excited to be able to play along with this one!!! Sorry I entered twice. My real entry is #19 not 18. Sorry I tried to delete it. OMG! How fun was this! I'm addicted to 3x3 cards! I am now making matching 3x3 envelopes with the new Envelope Punch Board from We R Memory Keepers!I finally got my hands on one after the release last summer! Yah!!!!! Entered my first 3x3 card set. I have a second made for tomorrow's blog post and am working on the 3rd. I love this challenge. It's the only one I try to actually complete. Love the cards from the team. These are all really cute mini cards. I love the critter theme too. 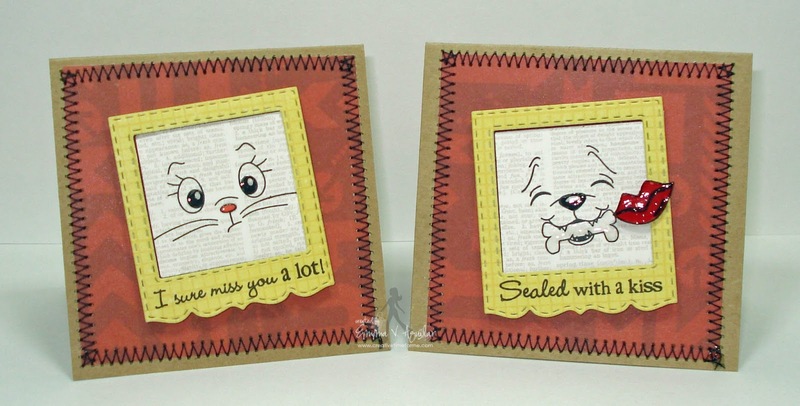 Happy to play along this month with some of your wonderful MCT stamps & dies. Here is my 2nd set. Later off to make them! GREAT challenge - so thrilled to play! Super fun challenge! Thanks for extending it out! Great job, love the challenge!! Hello Miss Emma, I join with this amazing challenge. I hope you like my project. Whew, I just made the deadline. Super fun challenge!